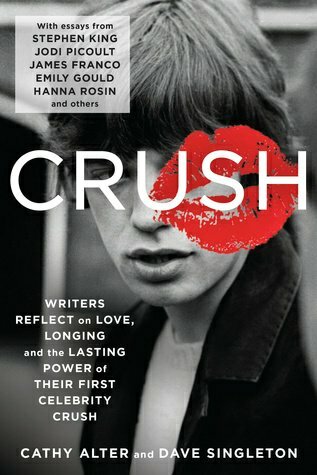 Crush brings together the nostalgic, cringe-inducing experiences of a selection of writers discussing their formative celebrity crushes. It’s a cute concept, but also one which allows for real emotions: some contributors experience sexual awakenings while watching Star Wars, while others are woken up to gender roles thanks to Little House on the Prairie. Some accounts are very short (Stephen King’s takes up under a page) while other imaginary love affairs require a page count closer to a novella (clearly Brian Austin Green is a tough guy to get over – this one was one of my favourites, actually; it’s extremely funny). Celebrity crushes are surely one of the great unifying themes of human experience, aren’t they? Reading this book inspired me to recall some of my own, which range from the reasonably normal (Robbie Williams up to and including Everything Changes) to the obsessive (former Ipswich Town captain Matt Holland, who I once met and found myself so overcome I genuinely nearly cried), to the faintly embarrassing (look, fancying Zach Morris was way too obvious so lusting after AC Slater was fine at the time). At the age of 14, I had a sweet imaginary romance with Taylor Hanson and aggressively fought anyone who said he looked like a girl. In the mid-90s, I was obsessed with the largely fogotten TV show Seaquest DSV and its young star, Jonathan Brandis, about whom I once had a very nice, chaste dream in which he was my boyfriend and I was a marine biologist (incidentally, I Googled Brandis yesterday and discovered that he died in 2003, so clearly my commitment wasn’t that intense). Even now, as a mature 34 year old, I will pretty much only watch films that star a hot man called Chris. I love a good celebrity crush. I don’t care if it makes me seem shallow or overly concerned with appearance or fooled by the trappings of fame: in real life, I am none of these things, so sometimes it is rather pleasant to let my mind wander towards a well-sculpted pair of cheekbones. The Premise: Leo, Libra and Orion are counting down to the day they can go home. Of course, having been born and raised on a spaceship, they haven’t ever actually been ‘home’ to Earth, so it’s a complicated situation made more so by government secrets, unexpected twists and messy family relationships. Why you should read it: Satellite is an excellent YA sci-fi, with emphasis on the ‘sci’ part. The beginning, with the action set on board the spaceship, is hugely detailed without ever becoming too much. I’m no scientist and I can’t pretend to have understood all the science exposition, but I was never less than intrigued by it. The story develops superbly too; I was worried that I’d lose interest once the action moved Earthwards, but Lake’s plot is twisty and turny enough to keep any reader enthralled. I lap up space-set novels anyway, but I was no less interested when the setting became more familiar. There are lots of absorbing elements to the plot, my favourite of which was the complex family dynamic between Leo and his astronaut mother and retired astronaut grandfather. There’s so much bubbling beneath the surface in these relationships that I was very much intrigued. And, once again, space. SPACE! Be warned: the narrative, from Leo’s PoV, is written in a sort-of text-speak, without certain punctuation marks and with abbreviations like “c” for “see”. To begin with, I will admit to having found it quite irritating (I’m an English teacher, okay? It’s in my nature to want to add capital letters), but stumbling across a blog in which Lake explained his decision along with his predictions for the future of punctuation helped me to accept it as a necessary part of the narrative. So don’t be put off by the style: if I can deal with it, I reckon you can too.